In the most recent incident, a Metrobus operator refused to allow a customer to exit the bus after a verbal dispute. He was arrested by Metro Transit Police on Saturday, July 25, and charged with kidnapping. The bus operator is on paid administrative leave, pending the outcome of an investigation. 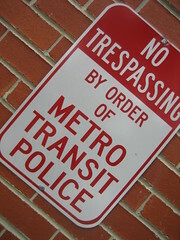 Metro officials will determine an appropriate level of discipline once the investigation is complete. First it was sleeping on the job, or reading a book, or texting, and now we’ve seen WMATA employees go from light misdemeanors straight into felony charges. I was sitting here thinking just now that what we really need to see from WMATA drivers, in order to pine for reading, texting and sleeping, is something along the line of kidnapping, or assaulting an off-duty police officer or maybe even light bank robbery. Perhaps what we’re missing is an appreciation for the difficulty of light rule-breaking? This entry was posted in: Crime & Punishment, The Daily Feed, WMATA, WTF? !